SnFRadio announcements reach attendees locally on our 1510 AM broadcast and worldwide via our audio stream on LiveATC.net/snfradio. Announcements are aired prior to and during SUN ‘n FUN. Announcements are also added to our year-round SnF Radio programming loop which will provide additional exposure for your company throughout the year. In addition, purchasing a SnFRadio an announcement package qualifies you for a live interview on SnFRadio, giving you approximately 10 minutes to promote your company live on air. 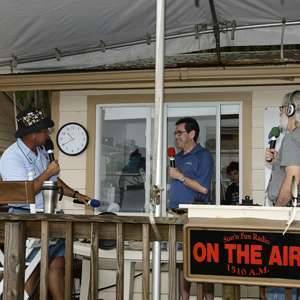 We also provide visibility for your company by placing your logo on promotional signage located on the SnF Radio broadcast deck adjacent to the popular Sunset Grill. Additional packages & sponsorship opportunities are available; please contact us for more SnFRadio exposure options. With the purchase of one of the announcement packages above and selecting the box below, one of your spots can be aired during the daily airshow! Click here to download the 2019 SUN ‘n FUN Advertising Packet that contains the SUN ‘n FUN Radio Announcements contract and mechanical requirements. Don’t forget to checkout our Discount Packages! Questions or more information, please call 863-904-4003 or email: advertise@flysnf.org.